Free Radical Damage is the deterioration of cells and DNA caused by environmental stressors. These may be sun, chemical exposure and pollution. The results is oxidation which decomposes or mutates the cells. This is best illustrated by an apple that has been bitten. Oxidation causes the apple to brown. Just like in an apple our body ages from oxidation. A chain reaction starts at the molecular level that destroys and mutates cells. 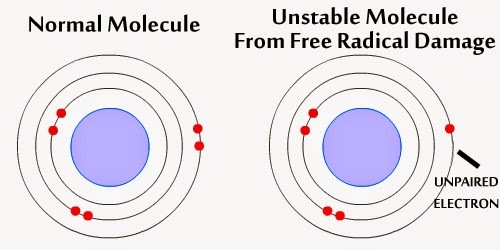 Oxidation and Free Radical Damage occur when the paired electrons in an atom or molecule receives an environmental effect that breaks an electron pair. This creates the molecule to be unstable. In return this causes the molecules around it to be effected by the unstable molecule making a chain reaction in mutations. The DNA Strand has a complex makeup that tells the cells how to function and do their job. 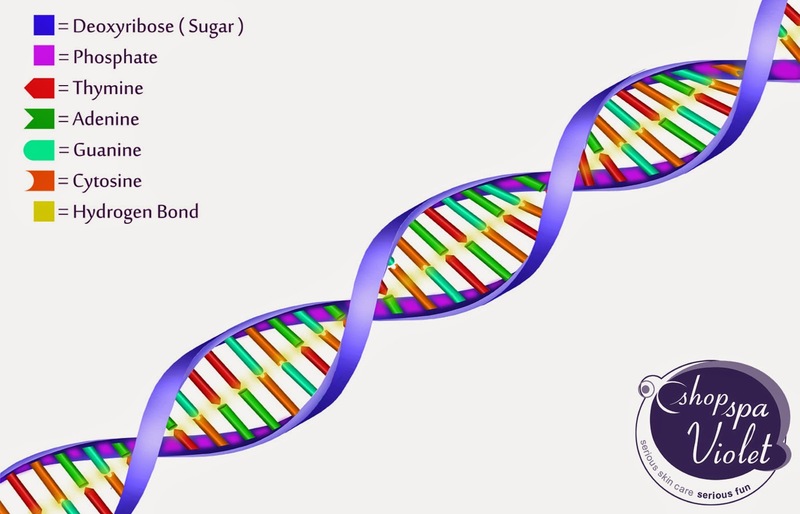 Here is a healthy DNA structure with the elements in the correct places. At a DNA level this in return causes mutations in the structure, changing the makeup of the cell and causing damage. The DNA propagates to cause a chain reaction of damage, leading to decomposition, death, and disease of the cells. The DNA Strand breaks from the Free Radical Damage, and when the repair occurs there is a chance that the repair will be done unsuccessfully and lead to mutation. This mutation will continue in a chain reaction to new cells being built. You may have experienced that when you put lemon juice on an apple, the browning of the apple slows down greatly. The lemon is as an anti-oxidant that slows down oxidation. Like the lemon, our cells can benefit from anti-oxidants to slow down the aging process. More importantly, anti-oxidants not only slow, but stop the chain reaction of damage on a molecular or DNA level from continuing to happen. Vitamin C Serum: Vitamin C is a powerful anti-oxidant. Ascorbic acid can overcome free radical damage by neutralizing the molecules that have had an oxidation reaction. Vitamin C also acts as a protector that will stifle oxidation. Ascorbic acid is present in all plants which provides a barrier to environmental stress. Vitamin E: Vitamin E is the most lipid soluble anti-oxidant and is able to protect the membranes of the molecules from free radical damage. Vitamin E can break the chain reaction of mutations that have started and repair the damage that has occurred. Ferulic Acid: Studies have shown that ferulic acid can destroy mutated cells such as cancer cells and reduces Thymine Dimers. When Ferulic Acid is combined with Vitamin C and E, a synergistic effect is created. Another poignant CE Ferulic fact is that UV light renders the acid more effective. Ferulic can neutrilize certain types of free radicals that other anti-oxidants may not repair. Applying these products in the AM will boost protection for the day. As an added benefit they will aid in regenerating cells, building collagen, elastin, evening skin tone and reducing hyperpigmentation while brightening. WOW!